Cotton Incorporated is charged with communicating the benefits of cotton to the consumer and driving demand for the fabric of our lives. However, in a world saturated by marketing it is getting harder to stand out get your message through to your audience. The marketing challenge in today’s environment is twofold: The first is finding cost-effective programming (TV, digital, etc.) that can reach a large percentage of the target audience at a time when consumer viewing habits are changing rapidly and the second is developing a message that can be impactful over a wide array of media options. Cotton Incorporated’s new Cotton. It’s Your Favorite for a Reason advertising campaign was developed for use in multiple media outlets. In addition to television, Cotton Incorporated now communicates with consumers through a variety of digital and social media channels such as Facebook, Twitter, Pinterest, Instagram and You Tube. Content on these social and digital channels is updated almost daily by staff, company bloggers, developers, and partners. For example, on Facebook, Cotton has over 1.5 million “likes” and they highlight and drive shopping for cotton apparel by promoting cotton-rich items on the Shop Cotton blog. A newly-created blog, Talk Cotton, features product adoptions by respected brands such as Eddie Bauer, and Gerber Diapers. A unique digital partnership with online apparel retailer Rue La La has given 20 million consumers the opportunity to both see a cotton message and to shop for cotton merchandise. And as the ever-changing consumer continues to evolve, so will Cotton Incorporated’s overall communication strategy. Production of the 2016 Cotton Board’s Industry Calendar is now complete and the calendars have been mailed to every cotton gin in the U.S., as well as all growers who produced at least 50 bales of cotton in 2014. This year’s calendar is unique from past calendars and celebrates major accomplishments stemming from The Cotton Research and Promotion Program over the past fifty years. 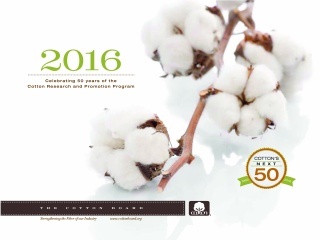 From the formation of Cotton Incorporated and the introduction of the iconic “Fabric of Our Lives” advertising campaign to wrinkle-resistant cotton and ultralow gossypol cottonseed, the calendar gives a recap of some of the most effective projects designed to improve the demand for and profitability of cotton. If you did not receive a calendar and would like to, please call The Cotton Board at 901-683-2500. NY futures and the A Index moved slightly higher over the past month, while other benchmark prices were unchanged. Prices for the March NY futures contract rose from levels near 62 cents/lb to those over 65 cents/lb. The A Index increased from values near 69 cents/lb to those near 71 cents/lb. This month’s USDA report featured decreases to forecasts for 2015/16 world cotton production and consumption figures. The reduction to the global production figure was a significant 1.9 million bale decrease (from 105.6 to 103.7 million). This revision suggests that the 2015/16 crop will be just marginally above the recent low set in 2009/10. The global mill-use estimate was lowered by 200,000 bales. At the country-level, changes to production. At the country-level, changes to production forecasts were widespread. The largest decreases were for Pakistan (-1.0 million bales, to 8.0 million), China (-700,000, to 24.3 million), the U.S. (-250,000, to 13.0 million), and Turkey (-150,000, to 2.7 million). These declines were partially offset by a 300,000 bale increase to the Australian figure. In terms of exports, the largest revisions included a 900,000 bale increase to the projection for India (to 5.3 million), which is expected to capture most the rise in import demand from Pakistan and Bangladesh. Other important changes to export numbers included the 200,000 bale increase for Brazil (to 4.2. million), the 100,000 bale increase for Australia (2.6. million), the 100,000 bale decrease for Greece (to 0.9 million), and the 200,000 decrease for the U.S. (to 10.0. million). USDA forecasts for both production and consumption have been steadily lowered since the initial set of projections was released in May. The initial forecast for world production was 111.3 million bales and the current estimate is 103.7 million (a decline of 7.7 million). The initial forecast for world mill-use was 115.5 million bales and the current estimate is 111.4 million (a decline of 4.1 million). The largest country-level reductions for both harvest and consumption figures have been for China. Since May, the USDA forecast for Chinese production fell from 27.0 to 24.3 million (a decline of 2.7 million bales) and the forecast for Chinese mill-use fell from 36.0 to 32.5 million (a decline of 3.5 million). This season’s reductions to Chinese figures emphasize how China has been a challenging market for cotton in recent years. Relative to peak in 2007/08, Chinese production in 2015/16 is down by more than a third. The steep 5.7 million bale decrease this crop year (from 30.0 to 24.3 million), allowed India (28.5 million) to surpass China as the world’s top producer, a title that China had held without interruption for three decades. China remains the world’s largest spinner of cotton, but Chinese mill use has also suffered steep declines after peaking during the 2007/08 crop year (51.0 million bales). Since that time, Chinese consumption has also decreased by more than a third (32.5 million in 2015/16). Lower levels of Chinese consumption can be expected to slow the process of drawing down Chinese stocks. With statements from Chinese officials indicating that the reduction in reserve supplies would involve lower levels of import quota, an implication for the global market is that Chinese import demand could be expected to remain at lower levels for several years. Following this month’s revisions, China is expected to import only about one fifth of the cotton it brought into the country in 2011/12 (24.5 million bales) and it is predicted that Bangladesh will surpass China as the world’s biggest importer. This crop year, higher import volumes from Pakistan, Vietnam, and Bangladesh will help offset some of decline from China. However, the pullback in import demand from what has been the world’s dominant cotton buyer can be expected to hold international cotton trade volumes at lower levels, and therefore maintain some downward pressure on prices.